Protesters gather to show support for the Deferred Action for Childhood Arrivals (DACA) program during a rally outside the Federal Building in Los Angeles, U.S., Sept 1, 2017. Corporate executives, Roman Catholic bishops, celebrities and immigrants have become unlikely companions in an effort to pressure national leaders to save an Obama-era program that shields young immigrants from deportation. Immigrant groups have been staging daily protests in the scorching Phoenix heat, mobilizing people through phone banks in California, and demonstrating outside House Speaker Paul Ryan's church and office. Archbishops around the country have been sending letters urging the president to maintain the program. The CEOs of Microsoft, Apple, Google, Facebook, Starbucks and other companies also joined the effort, saying the economy will take a hit if the program is eliminated. 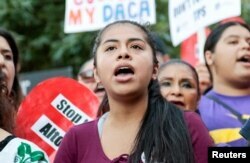 The campaign comes as President Donald Trump is weighing whether to eliminate the Deferred Action for Childhood Arrivals program, which has allowed nearly 800,000 immigrants who were brought to the country illegally as children to remain in the U.S. and legally work. The White House says Trump is expected to announce his decision Tuesday. Immigrants are bracing for the prospect of losing their jobs as their work permits end and possibly being deported if the president does away with the program. Eli Oh of San Jose, California, said he was working as a waiter to pay for his nursing degree before he enrolled in the program. Oh, 30, has lived in the United States for nearly two decades since his Korean parents overstayed their visas. He works as a nurse who responds to hospital emergencies, and he fears he'll be unemployed if his work permit goes away. "I went from saving lives at a hospital and delivering health care, and now ... I might have to drive Uber to pay rent," he said. Rocio, a Deferred Action for Childhood Arrivals (DACA) program recipient, shouts with supporters during a rally outside the Federal Building in Los Angeles, Sept. 1, 2017. Trump railed against the Obama program on the campaign trail, calling it illegal "amnesty." He later said it's been one of the most difficult issues he's dealt with. Republican officials from 10 states have threatened to sue to stop the program. They gave the Trump administration a September 5 deadline to act, although the attorney general of Tennessee, Herbert Slatery III, said Friday that his state would no longer pursue the lawsuit. To qualify, immigrants must have proof that they were brought to the U.S. before they reached age 16. They can't have a criminal record, and their work permits and deportation reprieve must be renewed every two years at the cost of nearly $500, plus costs to hire an attorney to help with the process. The issue is especially prominent in California, home to one of every four people covered by the program. More than 200 people gathered outside the federal office building in Los Angeles on Friday, calling on Trump to continue the program. They chanted, "If they don't let us dream, we won't let them sleep," and "The people united will never be divided." In Arizona, a coalition of immigrant rights groups set up a protest camp in front of Immigration and Customs Enforcement offices near downtown Phoenix in the midst of a heat advisory and temperatures of nearly 110 degrees. 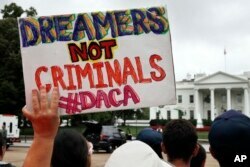 FILE - A woman holds up a signs in support of Deferred Action for Childhood Arrivals, or DACA, during an immigration reform rally at the White House in Washington, Aug. 15, 2017. "We are calling on people of conscience that if you believe that this is an injustice, there's no room to stay silent. Silence allows for injustices to happen," Reyna Montoya told reporters Monday. Montoya said she was brought to Arizona as a teenager after her family fled political violence in Mexico. In Wisconsin, the pressure extends specifically to Ryan, who has said previously he supports young immigrants. In a radio interview Friday, Ryan urged Trump to keep the program. The immigrant advocacy group Voces de la Frontera staged a protest outside Ryan's Roman Catholic church in Wisconsin on August 20. They planned a hunger strike starting Friday in front of his Milwaukee office and a march on Tuesday. Ilse Merlin of Racine, Wisconsin, said she was prepping for the worst by staying informed and active within the immigrant rights movement. "I'm not scared because I have faith that my God is going to provide and he's going to protect. That might not sound very reasonable, I guess, to people that don't have faith, but for me, I think it's enough," Merlin said. Merlin, 22, was brought to Wisconsin as a 5-year-old and has had protection from the program since it began. She said it changed her life by allowing her to get a job, which she used to pay for college. She works as a youth director at her church and hopes to finish a bachelor's degree to become a teacher. Others lending support for the program include celebrities such as TV mogul Shonda Rhimes and actress America Ferrera. Both took to Twitter to lend their support.